AAA Septic – Were #1 in the #2 Business! Were #1 in the #2 Business! 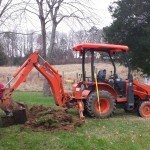 AAA Septic Service is a locally owned and operated septic and grease trap business serving Anderson, Blount, Knox, Loudon, Meigs-McMinn, Monroe, and Roane counties for over 20 years. Offering both residential and commercial services our licensed service team can tackle anything from a simple septic pumping or grease trap pumping to a complete sewer pipe, septic tank, or drain-fill replacement. When you call, you will be talking to a local employee who, in most cases, can give you a septic cleaning quote right over the phone; and there are never any hidden charges! You will always know our price before any work is started, so to get the job done right the first time, call AAA Septic Service. We are here to handle all of your Septic and Grease trap needs! This is what happens when you don’t properly care for your septic system and drain fill with the routine maintenance and treatment.